Last spotted in Hong Kong, Space Invader&apos;s 8-bit video game recreations returned to the streets of Paris over the weekend. 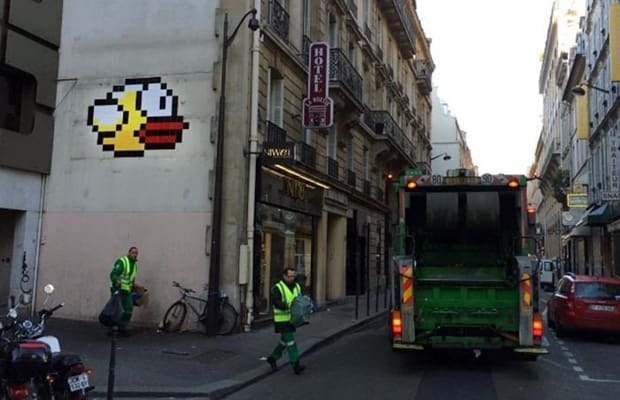 This time, the French street artist&apos;s invasion takes the form of Flappy Bird, a highly addictive and infuriating video game that took over everyone&apos;s iOS devices earlier this year. As you may have heard, Flappy Bird&apos;s developer Dong Nguyen pulled the game from mobile stores in early February to save the world from video game addiction and to spare those who hadn&apos;t yet opened pandora&apos;s box. For some people, Invader&apos;s latest work may only elicit haunting memories of green pipes, top scores, and crushed hopes. Regardless, the French artist&apos;s mosaic is a delightful tribute to the now recalled game. Located on 81 Rue De La Boetie, it also marks Invader&apos;s 1088th piece in Paris.